Stunning lattice backs and curled iron arms are what make the Sheffield Wrought Iron Patio Dining Set for 10 by Woodard stand out from the competition. 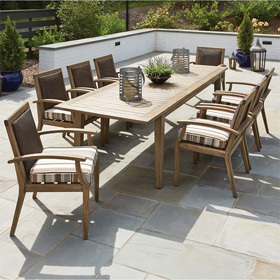 This set features iron ten dining chairs with luxurious seat cushions that invite groups to sit down for a memorable outdoor meal. The centerpiece of this set is a spacious dining table that includes a stylish beaded edge and an umbrella hole for adding a source of shade. All furniture in the Sheffield collection is made from the highest quality iron guaranteed to resist rust and corrosion for many seasons to come. Arm Chairs 21.75"W x 25.5"D x 38.25"H 28 lbs. Armless Chairs 20.5"W x 25.5"D x 38.25"H 24 lbs. Table 60"W x 70"D x 29"H 178 lbs.